The Carolina Hurricanes built an early lead and held on for a 4-3 victory against the host Blackhawks on Thursday night in the first game after a Chicago coaching change. Andrei Svechnikov, Jaccob Slavin, Phillip Di Giuseppe and Calvin de Haan scored to give Carolina a 4-0 lead. Di Giuseppe was in his first game since a recall this week from the American Hockey League. It was a rough beginning for new Chicago coach Jeremy Colliton, who at age 33 became the youngest head coach in the NHL following the firing of Joel Quenneville earlier this week. The turbulent stretch continued early in the game for the Blackhawks. 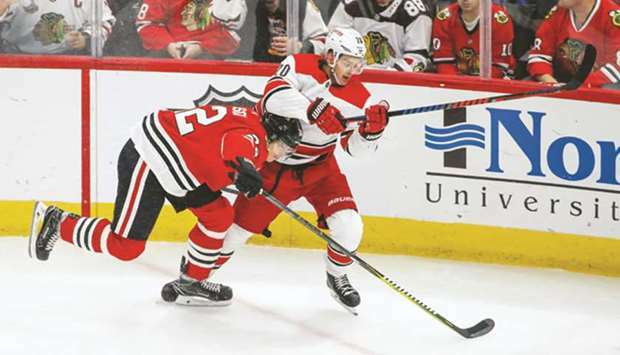 The Hurricanes snapped a five-game winless streak despite allowing the Blackhawks to build a comeback attempt off goals by Patrick Kane, Daniel Kampf and Nick Schmaltz. Rasmus Ristolainen scored at 1:38 of overtime as Buffalo came back to win at Montreal. Ristolainen scored his second goal of the season on a shot from the top of the right circle on a breakout after the Canadiens missed the net on a three-on-one chance. Vladimir Sobotka and Jeff Skinner each scored twice for Buffalo, and Conor Sheary scored once. Evan Rodrigues, Sam Reinhart and Jack Eichel each had two assists for Buffalo. Jonathan Drouin, Matthew Peca, Andrew Shaw, Tomas Tatar and Nicolas Deslauriers scored for Montreal. Max Domi had three assists. Shayne Gostisbehere scored 1:01 into overtime to rally Philadelphia past visiting Arizona. Gostisbehere added an assist, Scott Laughton scored two goals while Dale Weise and Travis Konecny had one goal each as the Flyers came back from a 4-2 deficit to win. Philadelphia goaltender Calvin Pickard allowed four goals and was lifted for Brian Elliott after the fourth goal. Elliott stopped all 16 shots he faced. Oliver Ekman-Larsson and Michael Grabner each had a goal and an assist for the Coyotes. Brad Richardson and Derek Stepan also scored one goal apiece. Roberto Luongo won for the second straight time in his return to the lineup to lead Florida past Edmonton in Sunrise, Florida. Luongo, who missed nine games, stopped 26 shots in his first home start. Evgenii Dadonov, Nick Bjugstad, Jonathan Huberdeau and Colton Sceviour scored for the Panthers, who earned their first win on home ice. Leon Draisaitl scored for Edmonton, and Connor McDavid, the league’s second-leading scorer, had an assist to give him 23 points for season. Colorado’s Mikko Rantanen leads with league with 23 points. Loui Eriksson had two goals and an assist as part of a five-goal second period for Vancouver, which finished a season sweep of host Boston. Bo Horvat added two goals and two assists, and Ben Hutton, Antoine Roussel, Erik Gudbranson and Jake Virtanen tallied one goal apiece for Vancouver, which won for the fourth time in five games. Markus Granlund and Nikolay Goldobin each had two assists. Jake DeBrusk had two goals and an assist, and Matt Grzelcyk, Patrice Bergeron and Danton Heinen had a goal apiece for Bruins, who lost for just the second time at home this season. David Krejci had three assists, and Torey Krug added two. Tyler Johnson scored the tiebreaking goal with 1:26 left in the third period as host Tampa Bay beat New York. Mathieu Joseph and JT Miller scored in the second period and Steven Stamkos added an empty-netter with 9.9 seconds remaining for the Lightning, who have won four straight and lead the NHL in points. Goalie Andrei Vasilevskiy made 35 saves. Josh Bailey scored both goals for the Islanders, who have lost two straight and had their point streak snapped at seven games. Goalie Robin Lehner recorded 23 saves. Vegas’ struggling offense came to life in a road win over Ottawa. Pierre-Edouard Bellemare recorded a goal and an assist, and Jonathan Marchessault, Shea Theodore, Nick Holden and William Carrier also scored as the Golden Knights reached the five-goal plateau for the first time this season. Vegas entered the game ranked third to last in the league in goals scored and second to last in shot percentage. Matt Duchene, Ryan Dzingel and Thomas Chabot scored for the Senators. Devin Shore scored his second goal of the game with 5:47 to play, and Tyler Seguin snapped a 12-game goalless drought with a second-period tally as Dallas defeated visiting San Jose. The Stars snapped a two-game losing streak and beat the Sharks at home for the fifth straight time. San Jose’s loss ended a two-game win streak and was just the Sharks’ second game without a point in its past 10 outings. San Jose’s Joe Thornton, who had an assist, played in his 1,500th NHL game, becoming just the 19th player in league history to reach the milestone. Thornton is also one of 13 players in NHL history with 1,000 assists in his career.